Every place has its own character, and a lot of that character comes, subtly and quietly, from the trees that grow there. For all I know, I’m completely alone in this, but sometimes I just sort of fall in love with a particular kind of tree. Trees can have a huge impact on me - aesthetically, emotionally, or (in isolated unfortunate cases, physically). I’ve never been asked the question, but I always think I should be: What are your favourite trees, in all the countries you’ve been to? So thirteenth in the World Tour Highlights series, in alphabetical order, are my favourite trees (padded out with other plants, flowers and fungi to make 25). 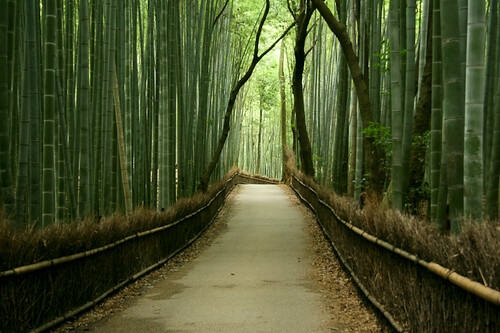 Bamboo is quintessentially Asian, and although I’ve seen it everywhere from Argentina to Fiji, I remember it most in China and in Japan. The famous upside-down tree. I saw them again in Australia, but they’ll always be the iconic African tree for me, since that’s where I saw them first. Their barrel-shaped trunks are topped with stubby, spindly, bare branches, exactly as if someone had buried their crowns in the dusty ground and left the roots exposed to the sky. I love all mushrooms and fungi. Every autumn at home I go on a mushroom-hunting expedition. When Sheryl and I arrived in the South Island of New Zealand I was happy to discover that it was mushroom season there. 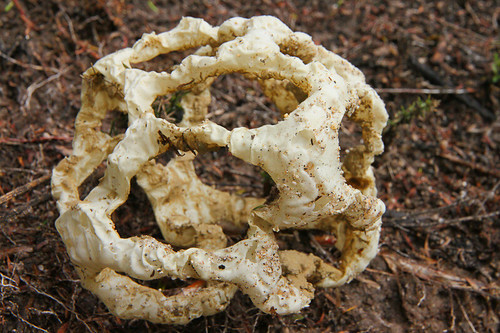 We saw a lot of good ones in Fiordland National Park but had to wait until we got to the other end of the island before I saw the one I really wanted to see - the bizarre Basket Fungus. They grow in a round pouch mostly buried in the ground, and when they’re ripe any little bump will split the pouch and let the compressed fungus inside explode out into a big hollow ball made of crinkly white slime-covered tubes. They’re a member of the stinkhorn family, so when Sheryl and I went hunting them in Farewell Spit and in Picton we often found them with our noses before we saw them. A fond memory from the deserts of Namibia. 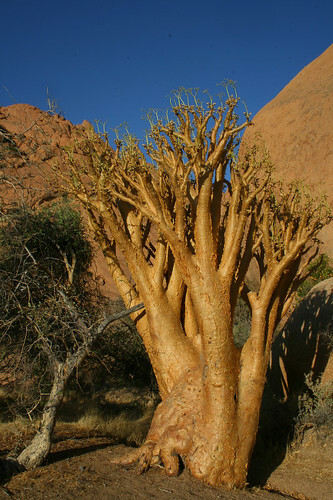 A rubbery, alien-looking tree with soft papery golden bark and a bulbous trunk and branches. They’re actually succulents, so more closely related to cactuses than woody trees, and they’re so flexible that the wind makes them vibrate - for that reason, I thought these were the trees referred to as Quiver Trees for the longest time, only to find out that Quiver Trees were another tree entirely. We saw them all over Namibia, growing from seemingly barren rock outcrops in the desert. Cycads and fern trees always thrill me. 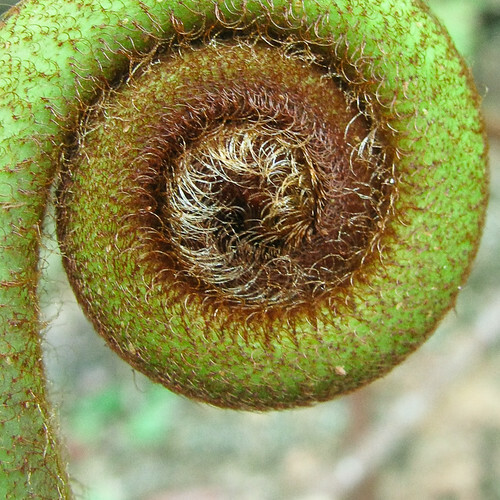 The curled frond is New Zealand’s unofficial emblem, and no wonder - the forests there are full of a hundred variations: giant ferns than unroll themselves straight from the ground, or tall palm-like trunks with a spray of fronds at the crown. They’re so alien-looking and so green and lush. Whenever I walk through a fern forest I like to pretend to myself that I’ve been sent back in time 175 million years to the middle of the Mesozoic Era and with every bend in the trail I might see a dinosaur. Fig trees are everywhere, but there are two kinds I love particularly. There’s the parasitic Strangler Fig, which begins life as a seed blown by the wind into the branches of another tree, and then sends snaky roots winding down to the ground, using its host for support until it’s finally choked to death. Sometimes the host tree rots inside the strangler’s grasp and only the fig is left, a hollow tubular net of branches holding air. 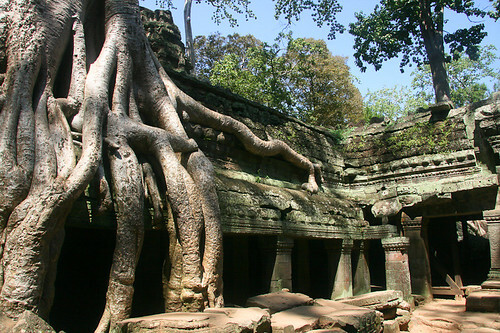 I remember these trees from every jungle and rainforest, and in cities in India and Malaysia, but I recall them best at the temples of Angkor in Cambodia. 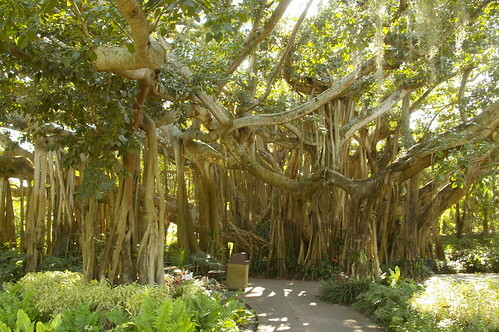 Banyan trees are another fig variation. These are immense trees that send down creepers from their branches. When the creepers touch the ground they grow into new trunks, so that in time one tree can become a huge forest. Walking among the trunks of a banyan grove can be a spooky and awe-inspiring experience. It took me ages to find out what this tree really was. I saw its fruit washed up on shore as early as India - they look like squared-off coconuts with one pointy end. And then I saw them blooming in Borneo - their flowers are a spray of white and pink threads in a cup of waxy white petals, and have a very strong scent. But no matter how many places I asked, nobody knew what they were called. I begged a hundred locals in different countries for the name of the tree in their language, thinking that would give me a starting point, but every one just shrugged, looked either puzzled or embarrassed, and told me they didn’t know, or that those trees didn’t really have a name. It took me two and a half years, but finally I came to Fiji and finally found a man who knew. 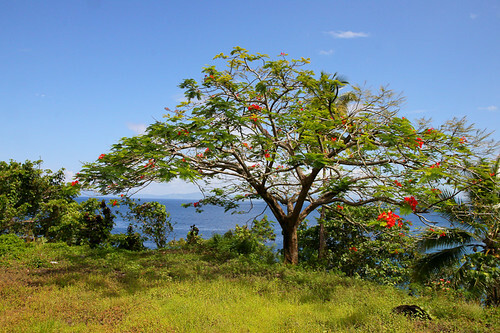 Their name in Fijian is vutu, and that led me to Barringtonia asiatica, the Fish Poison Tree, so named for its toxic effect on fish. It’s also called the Box Fruit Tree, for the shape of the floating fruit. 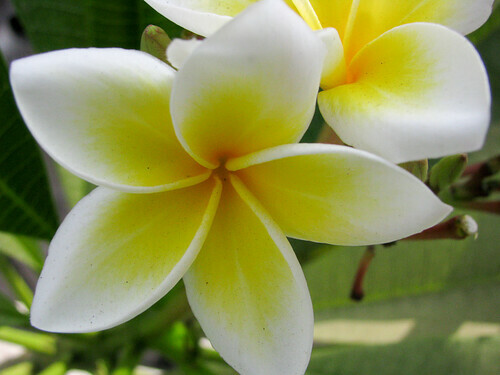 Frangipani flowers are emblematic of the tropics. Waxy white or pink swirled petals with a yellow centre. The spindly branches of the trees always look bare and dead to me, with more flowers than leaves. I’ve spent many nights in the tropics with the heavy, sweet scent of frangipani filling the air. 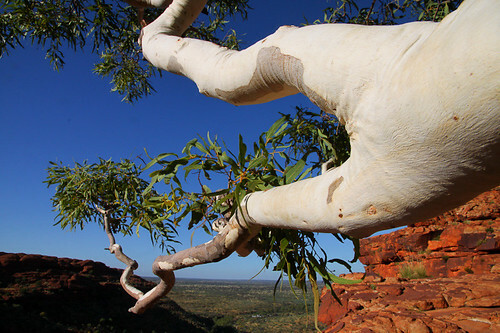 These eucalypts are named for their thick, wrinkled, spectrally white trunks and branches. They grow on the banks of Outback Australia’s dry riverbeds. The white of their bark is always shocking against the red rock and the red dust, and the little shade they give from the merciless sun is always welcome. Another denizen of the tropics. I remember seeing it for the first time in Laos, but I may have seen it before that. They have long, dangling bracts of deep red flowers, waxy and hard and flat, pointing downwards, offset like zipper-teeth on a stem. 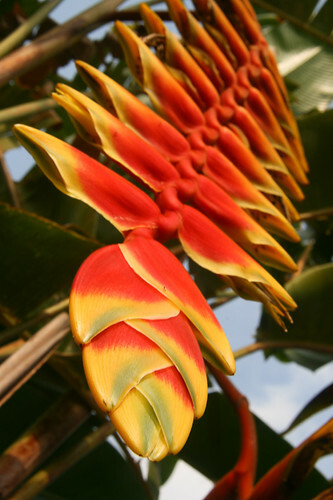 They’re sometimes called Lobster Claw plants for the shape of the flowers. One of my favourite trees. Although I saw it again in Australia and Argentina, for me it will always be iconic of Africa where I saw it first. 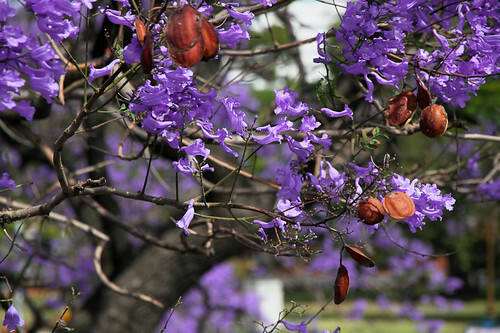 Arriving in Nairobi from Europe, the whole city was filled with these big trees covered in deep purple flowers. 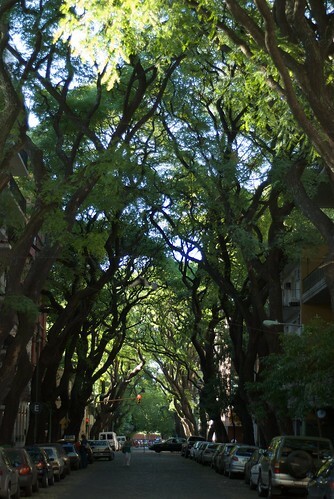 And in Buenos Aires in the springtime the streets are lined with blossoming mature jacaranda trees. When the flowers begin to fall, the plazas and avenues were thickly covered in drifts of purple. 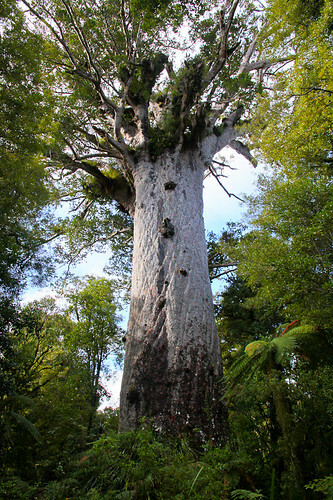 New Zealand’s kauri trees are magnificent. The whole country was covered with them once, but now only isolated stands remain, protected by law. Kauri are massive, tall trees. Their scaly trunks are perfectly round, straight and bare of branches until the crown. 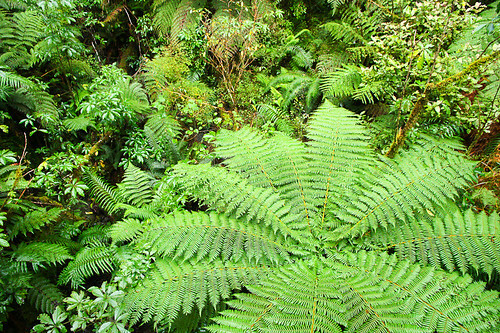 They’re gigantic arks of life, supporting hundreds of species of birds and insects, and their branches are covered with a profusion of ferns, mosses and epiphytic plants. Sheryl and I drove for hours north of Auckland to see the tallest living kauri, Tāne Mahuta, the Lord of the Forest - more than 50 meters tall and 2500 years old, and Te Matua Ngahere, the Father of the Forest, even older and with a trunk so big around it would take ten people holding hands to encircle it. 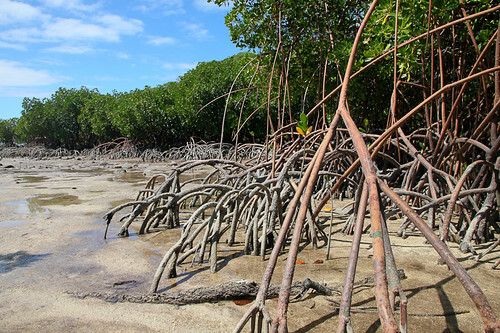 Stands of spindly mangrove trees line the rocky shores of the island of Nananu-i-ra just off the north coast of Viti Levu in Fiji. They stand on tiptoe, with their trunks off the ground, supported by their roots, just as if they were about to scramble back to the water. It’s hard enough to fight your way through the interlocking roots when the tide is out, but at high tide when the roots are all under water it’s a quick way of breaking an ankle. Sheryl and I discovered this on our separate circumnavigations of the island, and had to resort to swimming, wading around, or forcing a scratchy path on the inland side. 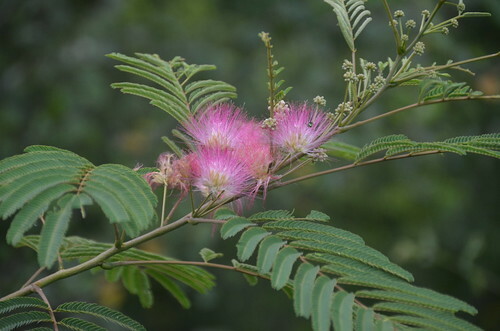 The famous Sensitive Plant. I first encountered it in India, and have seen it through the tropics ever since. And I think I have fondled every single plant I’ve come across. It’s irresistible - you stroke the leaves gently and they shrink and fold up almost instantly. I could do it for hours. All I really ever knew about papyrus was what I learned in history class: the ancient Egyptians made paper out of it. I never really thought about what the plant itself looked like. So when I was being poled along in a makoro dugout canoe through the Okavango Delta in Botswana, and the boatman started talking about the papyrus grass, I paid closer attention. 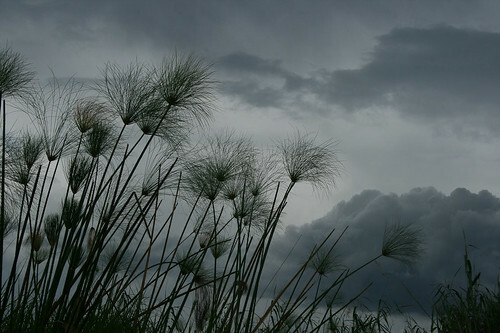 It’s tall marsh grass with big seed heads that rise up on long stalks like big green pom-poms nodding in the breeze. A bizarre species native to the jungles of Malaysia. Their round-bellied pitchers hang down from the plant on green stems. 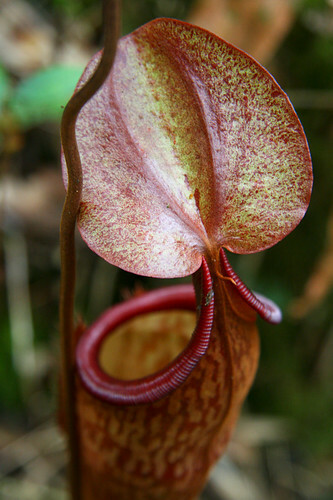 They’re rust-red and green, striped with veins, and have fleshy flaps that cover the open mouths of the pitchers. Pitcher plants are carnivorous - insects fall into the pitchers and drown in the standing water inside, where they’re slowly dissolved them to feed the plant. 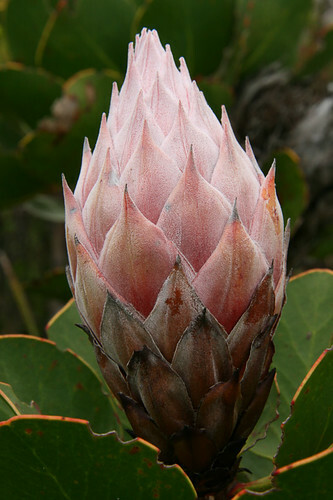 South Africa’s proteas are strange things, like flowers might look on another planet. They’re all big, chunky flowers, and the thick, fleshy, closely-laid petals of their buds look like fish scales in bright colours. Sheryl took me on a 4×4 expedition for my birthday in 2010, in the Cameron Highlands of central Peninsular Malaysia, to go and see the biggest flower in the world. They are huge - single flowers up to a meter across, sprouting from a vine half-buried in the jungle floor. They’re a strange flower, too, with their fleshy red petals speckled with white polka-dots. They feel like spongy leather - more like a fungus than a flower. They’re said to smell like a rotting corpse, to attract the flies that pollinate them, but Sheryl and I agreed that it was kind of a nice smell, actually. Another strange tree that I just can’t imagine Africa without. 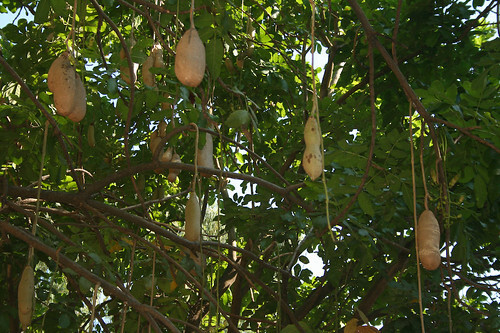 It has massive tan-coloured hard-skinned fruit that hang down like sausages in a butcher’s shop. We were told that only baboons have jaws strong enough to get through the tough skin of the fruit. 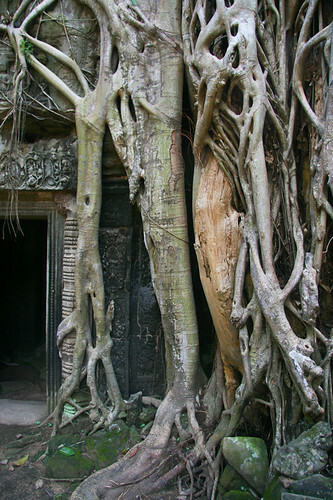 With Strangler Figs, above, these are the famous trees that are slowly tearing down the temple of Ta Prohm in Angkor, Cambodia. Their roots wind like liquid or like tentacles around and between the stones of the temple, snaking into the smallest cracks and growing. The sight of the temple drowning in tree roots is spooky and humbling. 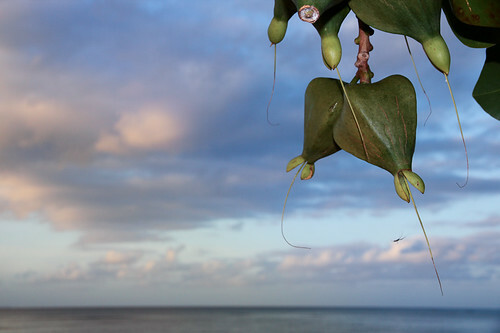 Not to be confused with the Silk Cotton tree above. 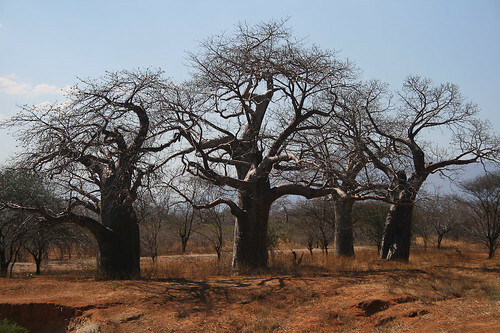 Silk Floss trees belong to the same family as the baobab. They have bulbous, barrel-shaped trunks covered in squat spines. 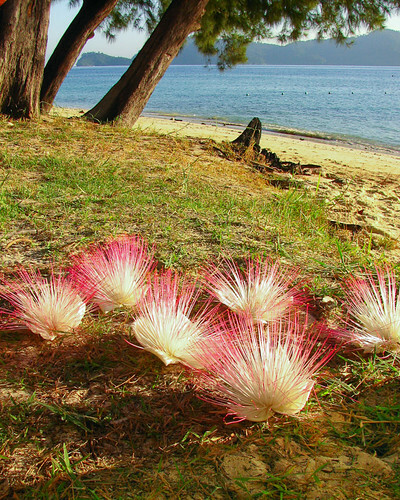 Their flowers are glorious pink and white-striped things like stringy hibiscus blossoms, and in the spring the trees are covered in white cotton puffs that the wind slowly shreds and blows to the ground. 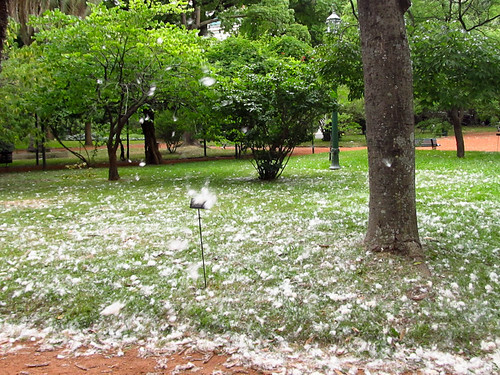 There was so much cotton on the ground in the spring in Buenos Aires that it looked as if it had snowed. Another strange carnivorous plant. We found it in the peat bogs of Fiordland National Park in New Zealand. 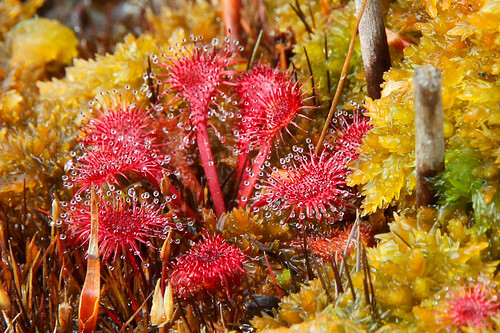 They’re tiny crimson plants with lobe-like leaves covered in sticky hairs. Insects get stuck and digested by enzymes in the fluid. Another tree I saw first in Africa and subsequently through the tropics. It has wonderful light, feathery leaves and bright orange petal-like flowers. The long seed pods dangle down from the branches and twist in the wind, and they taste really good too. In Buenos Aires in the springtime, Sheryl and I were always baffled when we’d be walking down the street or through a park and we’d feel drops of water (we hoped) sprinkling on us from above. There would never be anything above us but the branches of trees, and it was never raining. We were puzzled for ages and eventually came to the conclusion that these particular trees just… drip a lot. We could look up and see a cloud of tiny droplets falling in the sunlight, under the tree. I’m still not sure where the liquid comes from or why they drip. 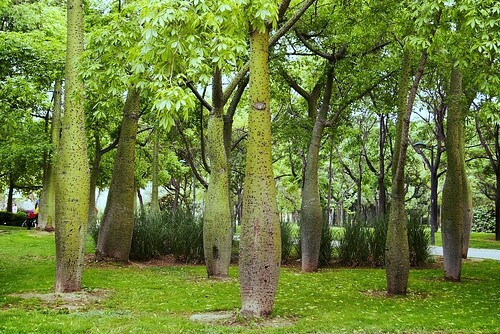 They’re called Tipa trees in Argentina - their Latin name is Tipuana tipu. They’re lovely tall trees with twisted black branches that arch over the streets, and they probably didn’t deserve the name we eventually gave them: “Pee Trees”. I never drank coffee before starting on this trip - I was always a dedicated tea drinker, and I’d always planned to make my pilgrimage to Darjeeling someday. 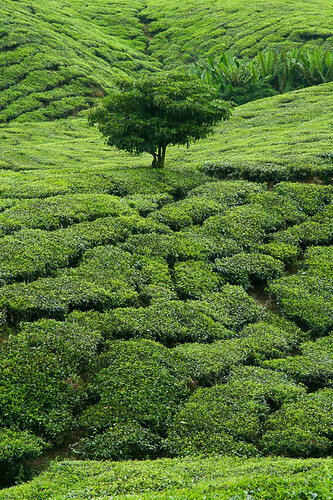 I did succeed in that, and the sight of the rolling hills covered in a flat green maze of interlocking pruned tea bushes was as satisfying to the eye as the drink is to the mouth. We watched the tea leaves being plucked by hand, one by one. Later, in the highlands of Malaysia, we visited another tea-growing region where the leaves are harvested with shears, which results in a much lower grade of tea. I love this list Chris! 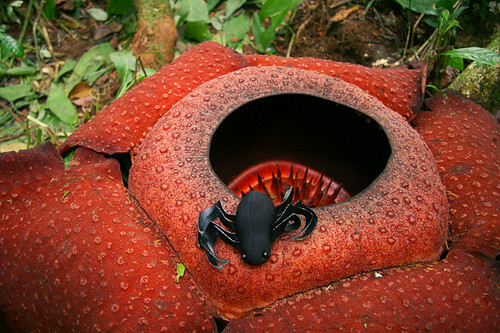 I’m excited to see a Rafflesia, those things look crazy! Thanks! I’m curious to find out what they smell like to you guys. I love this post and it’s nice to see a bunch of my favourites all together :). If only it was possible to bring them home with us and be surrounded by them………..